2 volunteers. 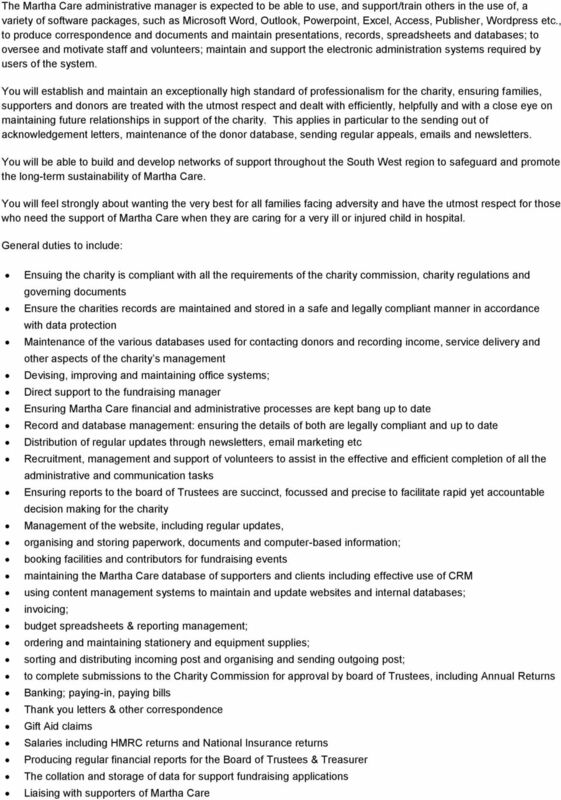 You will be responsible for undertaking the financial reporting to ensure the board of trustees are able to comply with their duties in accordance with the requirements of the Charity Commission. 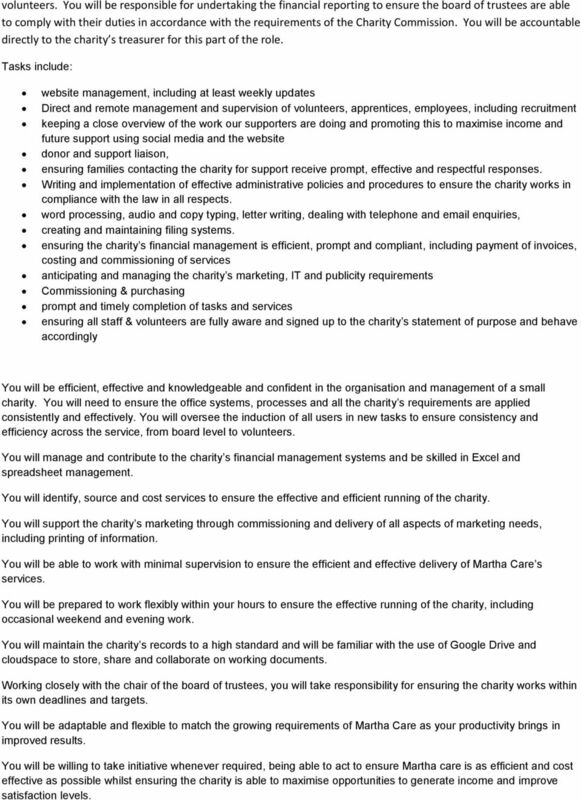 You will be accountable directly to the charity s treasurer for this part of the role. Tasks include: website management, including at least weekly updates Direct and remote management and supervision of volunteers, apprentices, employees, including recruitment keeping a close overview of the work our supporters are doing and promoting this to maximise income and future support using social media and the website donor and support liaison, ensuring families contacting the charity for support receive prompt, effective and respectful responses. Writing and implementation of effective administrative policies and procedures to ensure the charity works in compliance with the law in all respects. word processing, audio and copy typing, letter writing, dealing with telephone and enquiries, creating and maintaining filing systems. ensuring the charity s financial management is efficient, prompt and compliant, including payment of invoices, costing and commissioning of services anticipating and managing the charity s marketing, IT and publicity requirements Commissioning & purchasing prompt and timely completion of tasks and services ensuring all staff & volunteers are fully aware and signed up to the charity s statement of purpose and behave accordingly You will be efficient, effective and knowledgeable and confident in the organisation and management of a small charity. You will need to ensure the office systems, processes and all the charity s requirements are applied consistently and effectively. You will oversee the induction of all users in new tasks to ensure consistency and efficiency across the service, from board level to volunteers. You will manage and contribute to the charity s financial management systems and be skilled in Excel and spreadsheet management. You will identify, source and cost services to ensure the effective and efficient running of the charity. You will support the charity s marketing through commissioning and delivery of all aspects of marketing needs, including printing of information. You will be able to work with minimal supervision to ensure the efficient and effective delivery of Martha Care s services. You will be prepared to work flexibly within your hours to ensure the effective running of the charity, including occasional weekend and evening work. You will maintain the charity s records to a high standard and will be familiar with the use of Google Drive and cloudspace to store, share and collaborate on working documents. 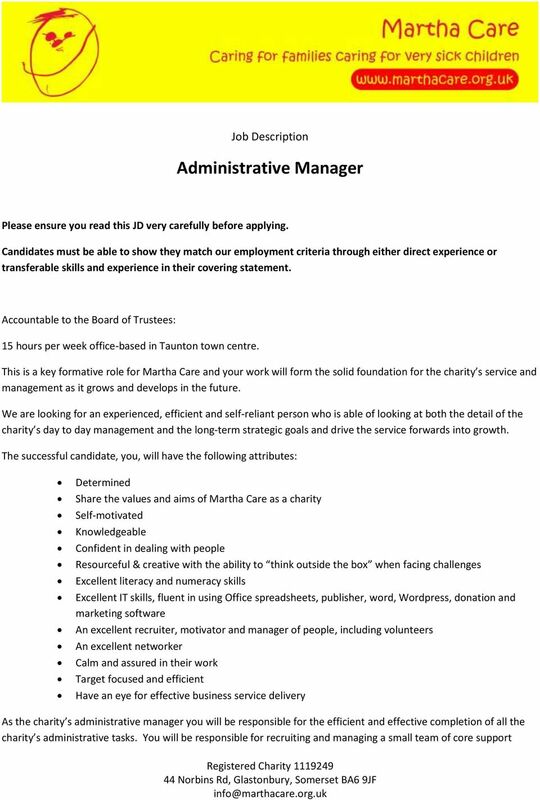 Working closely with the chair of the board of trustees, you will take responsibility for ensuring the charity works within its own deadlines and targets. You will be adaptable and flexible to match the growing requirements of Martha Care as your productivity brings in improved results. You will be willing to take initiative whenever required, being able to act to ensure Martha care is as efficient and cost effective as possible whilst ensuring the charity is able to maximise opportunities to generate income and improve satisfaction levels. 4 Monitoring advances in CRM data management & sourcing the best services to support the charity s aims Any other task commensurate with the role Other duties may include: recruiting, training and supervising junior staff and delegating work as required; manipulating complex statistical data; arranging both in-house and external events. To be available at additional times when required to complete specific tasks. 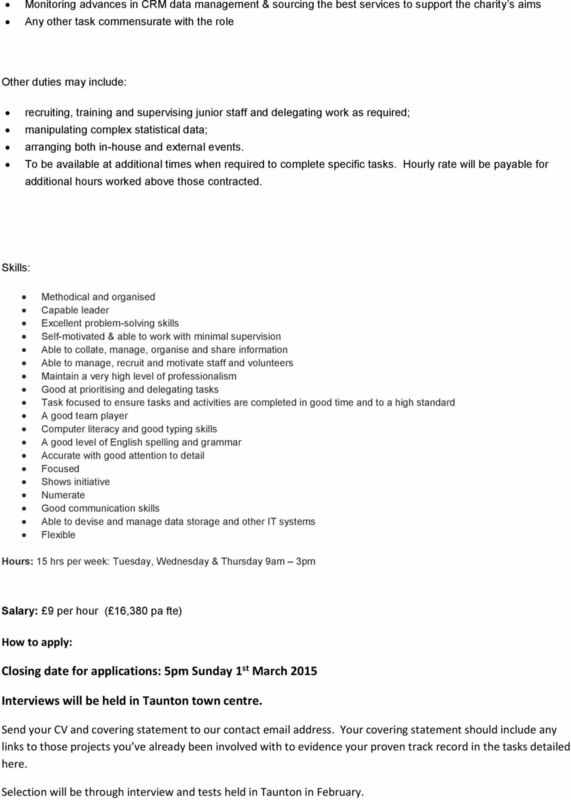 Hourly rate will be payable for additional hours worked above those contracted. Skills: Methodical and organised Capable leader Excellent problem-solving skills Self-motivated & able to work with minimal supervision Able to collate, manage, organise and share information Able to manage, recruit and motivate staff and volunteers Maintain a very high level of professionalism Good at prioritising and delegating tasks Task focused to ensure tasks and activities are completed in good time and to a high standard A good team player Computer literacy and good typing skills A good level of English spelling and grammar Accurate with good attention to detail Focused Shows initiative Numerate Good communication skills Able to devise and manage data storage and other IT systems Flexible Hours: 15 hrs per week: Tuesday, Wednesday & Thursday 9am 3pm Salary: 9 per hour ( 16,380 pa fte) How to apply: Closing date for applications: 5pm Sunday 1 st March 2015 Interviews will be held in Taunton town centre. Send your CV and covering statement to our contact address. Your covering statement should include any links to those projects you ve already been involved with to evidence your proven track record in the tasks detailed here. Selection will be through interview and tests held in Taunton in February. Visitor Services Supervisor Visitor & Commercial Operations Manager / Interim Head of Operations DATE JD PREPARED: October 2012. Please note if you are formally applying for the role interviews will take place week commencing 1st June. Thank you for your enquiry regarding the above post. Please find enclosed the application pack for this post together with various monitoring forms.